Currently on view in the Lucy Burne Gallery is the Creative Workshop’s Winter Adult Student Show: Portraits, Patterns and Projects. Featuring artists who’ve attended various Creative Workshop classes, the show represents portraits inspired by individuals, repeated elements of patterning, as well as collaborative/series based works. With a multitude of mediums ranging from painting (watercolor, oil, acrylic), to drawing (pencil, charcoal), to 3D works (clay, aluminum, stoneware), Portraits, Patterns and Projects presents a true representation of the variety of classes offered at the Creative Workshop. For some artists, this is their first time exhibiting in the Lucy Burne Gallery. For example, Beginning Drawing was an introductory class to artists Helen Ackert’s Child with Cherries, Jennifer Phillip’s, Cape Cod Lighthouse and Bruce McCannon’s, Leonardo Da Vinci Study. Their pencil drawings reflect incredible understanding of line quality and beautiful observational drawings emerging from introductory classes at the Creative Workshop. Cynthia Howell, also new to exhibiting at the Lucy Burne Gallery, contributed two striking watercolor paintings, Ginko and Apples, which can be seen together on the left wall upon entry to the gallery. Created in a Beginning Watercolor class taught by g.a. sheller, Cynthia uses sensitive color choices and a delicate brushwork that makes these paintings lovely. Along with the new artists exhibiting in Portraits, Patterns and Projects are returning artists who’ve taken many classes at the Creative Workshop. Maria Basil, a returning student of the workshop exhibits Pattern: Self-Portraits (below), created in Acrylic Painting. This work displays an intimate and creative self-portrait of the artist through cohesive pattern, intense color, and expressive paint application. 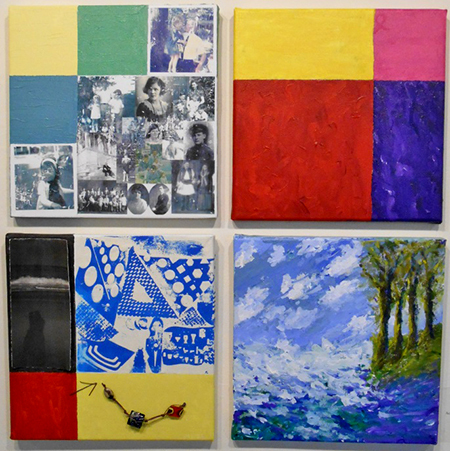 The separate canvases represent Maria’s creative interests, family history, enjoyed spaces, and personal experiences. Elements of printmaking, black and white photography, and jewelry making can be seen in the left canvases, showing Maria’s interest in artistic outlets supported by classes offered at the Creative Workshop. With the wide variety of works being shown in this Adult show, common themes were interestingly emerging. For example, Paul Dodd’s Investment Banker, Violet Paolucci’s clay vessel and Pauline Johnson Braun’s Dudley can be seen exhibited together in the Lucy Burne Gallery. When hanging the show, these striking pieces complimented one another by exemplifying mastery of the different mediums. These are just a few of the many works currently displayed at the Lucy Burne Gallery. The show is on view until February 19th and will be followed by the Winter Children’s show. We hope you’ll come by to enjoy the show and maybe even look into a class for yourself! Posted: January 21st, 2014 under Creative Workshop, Exhibitions. Why does the Burne Gallery website show hours, Monday – Thursday? Isn’t the MAG closed Mondays and Tuesdays? Yes. You are right. MAG is usually closed on Mondays and Tuesdays – but the Pavilion, including access to the Creative Workshop, is open 7 days a week, normally from 8 am – 5 pm.